I got to know about Kampung Day last year, planned to go down but was unable to coz someone (forgot whether its me or the boy) had taken ill. I was disappointed and when I saw this in my email I quickly mark this down in my calendar, we must make it down this year! From the event poster, it sure look like there's going to have loads of fun activities for us to enjoy! We'll see you there on Kampung Day on 12 December 2015! Who is Ground-Up Initiative (GUI)? Kampung Day is a community affair by Ground-Up Initiative, a non-profit organisation founded to bridge the disconnect that modern society creates between people, their communities and the environment. GUI currently sits on a 26,000 sqm piece of land in a land-scarce Singapore, an effort only possible with the persistence of its founder, Tay Lai Hock, and his core volunteers to win the support of the government over a period of two years. It started from only a 100sqm space and has grown to its size of 26,000sqm currently through a proven sustainable model and affirmation from both the local government and overseas entities. Through deliberate and thoughtful design of its programmes, GUI has created a space for its community of volunteers and visitors to grow, connect and inspire. The Kampung was raised from mostly discarded materials based on the 6R approach: Rethink, Refuse, Reduce, Reuse, Repair and Recycle. With the power of community coming together, GUI is cultivating a space that nurture rootedness and resilience by allowing people to experience groundedness, hard work and connection. 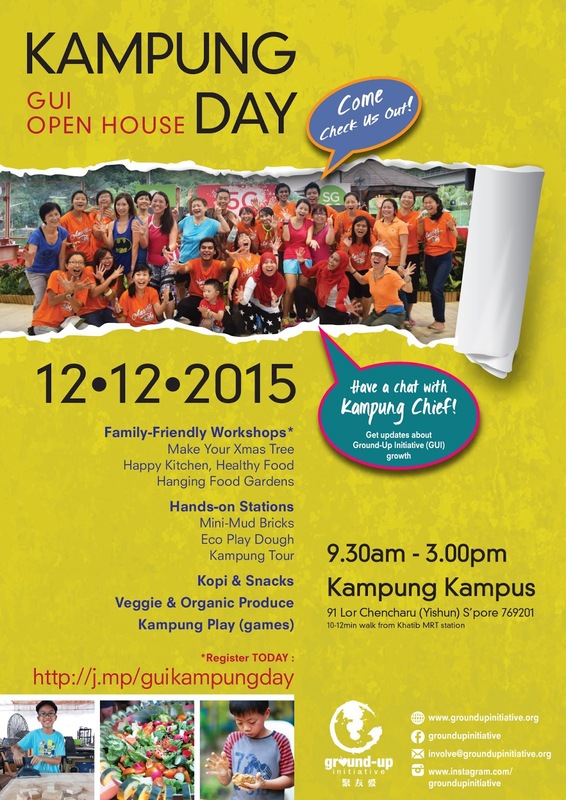 There would be lots of activities to partake in that brings out the art of sustainable living at their Kampung Kampus in Yishun! Exciting workshops are available on a registration basis at j.mp/guikampungday, and other activities are open to the general public to walk in. Not only will there be Kampung Play games and fun hands-on stations (eco play dough; mini mud bricks; Kampung tours etc), chemical-free fruits and vegetables by Farmily 家和农as well as kopi and snacks will be on sale! All activities are available on a contribution basis that goes toward supporting the operations of the Kampung Kampus.